Using both red and white quinoa, you get a colorful salad that is full of omega 3s and hearty enough that you can eat it as the main dish. The dates and currants give it a sweeter flavor, which is perfect for warmer weather and a meal outside. RELATED: Who Doesn't Love Gingersnaps? 1. Prepare the quinoa. Place in saucepan with 2 cups of water and a pinch of sea salt and bring to a boil. Cover and let simmer until water has cooked off, about 15 minutes. Set aside to cool. 2. In a large salad bowl combine chopped carrots, dates and currants. 3. To make the dressing, combine olive oil, apple cider vinegar and orange juice in a small jar or bowl. Add in mustard and whisk until well-blended. Stir in basil. 4. 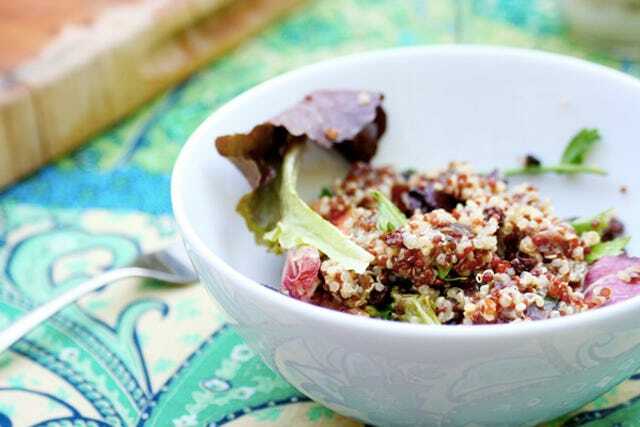 Mix in quinoa with rest of salad ingredients, and top with dressing. Toss together. Before serving, add in a couple of handfuls of mixed salad greens.